We’d love your help. 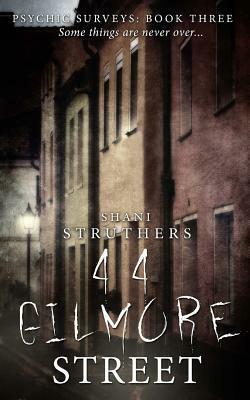 Let us know what’s wrong with this preview of 44 Gilmore Street by Shani Struthers. To ask other readers questions about 44 Gilmore Street, please sign up. Huge thanks to Shani Struthers, Crooked Cat Publishing and NetGalley for this copy in exchange for an honest review. While not as creepy as Rise to Me this still has that wonderful unsettling feeling to it. More of a mystery to this one too, the storylines twist and move about and you can pick up on where they may be heading. We learn more about the back stories of the characters, Ness mostly this time, and it's done very well, as is all the writing about them all. I still love Jed, he's wonderful! These books are so full of life and characters. They’re a mile a minute & the people in them are brilliant. Ruby who runs the business, Ness & Theo who balance things out, who if I’m honest are my favourite characters. The interactions are fab. The story this time had a kick to it that really got me going! I didn’t expect it to go the way it did. Really good!! The narrator was lovely, a calm voice that kept me interested. In fact I listen at work & talk during the stories not these I pause these. Can’t miss a bit. I have just finished reading Psychic Surveys Book 3 - 44 Gilmore Street - by Shani Struthers, and I have to say this is my favourite so far. My advice is to read the previous two first because there's a back story concerning the investigators themselves; and although each book stands alone you would miss out on their personal journeys, which are largely defined by their line of work. In particular, Ruby was badly affected in the 2nd book, 'Rise to Me' and that experience is carried into this one I have just finished reading Psychic Surveys Book 3 - 44 Gilmore Street - by Shani Struthers, and I have to say this is my favourite so far. My advice is to read the previous two first because there's a back story concerning the investigators themselves; and although each book stands alone you would miss out on their personal journeys, which are largely defined by their line of work. In particular, Ruby was badly affected in the 2nd book, 'Rise to Me' and that experience is carried into this one. Shani is a skilful author and as such you do become attached to these characters and want to know how they get on! I don't want to plot spoil but suffice to say there is a lot to keep you on your toes in 44 Gilmore Street and new themes are addressed - this time it's reincarnation. Elisha Grey is haunting herself! I found this book highly gripping and it kept me reading long after I should have turned out the lights - just one more chapter...just one more... it's a fast and entertaining read with quite a few surprises. The plots are set up so you just desperately need to know what happens; and one more thing -it's quite scary in places. She's a skilful author, like I say, and she knows just how to get under your skin! A new case for the Psychic Surveys team and a soul that needs to move towards the light. Ruby receives a call about a case she's unsure about. It may be another string to her company's 'bow,' but something about it unsettles her. Meanwhile, she and the rest of the team begin trying to help a male spirit move on from 44 Gilmore Street who seems determined to stay. The third in the series, this book builds upon the previous cases and more is learnt about the main characters as they begin there newe A new case for the Psychic Surveys team and a soul that needs to move towards the light. Ruby receives a call about a case she's unsure about. It may be another string to her company's 'bow,' but something about it unsettles her. Meanwhile, she and the rest of the team begin trying to help a male spirit move on from 44 Gilmore Street who seems determined to stay. The third in the series, this book builds upon the previous cases and more is learnt about the main characters as they begin there newest case. I think this case is the most intriguing so far, I thought I could see how things were going to link together, but was wrong. That just made things all the more interesting though! I've enjoyed the whole series so far and I like the author's writing style. All the books (but especially this one,) evoke a certain amount of concern and/or fear. Concern not that there's something lurking under the as you read, but that similar events could happen to anyone and anyone could need the help of Ruby or someone like her. Can I adopt Jed please? Just in-case! The books in this series are getting better and better. I like how we get to know the team better as well. When I started this series I thought what can you write about a haunted house... Well you will be as surprised as I was. I love the writing style and the great charaters. I received an ARC in exchange for a review so here is mine. I have read all of Shani Struthers books and i have found that each book she writes has surpassed the last. This genre is not an easy one to get right as it touches on a subject that has many different personal view points, however for me this author manages to deal with this in a sensitive and intelligent manor. This latest book is well written, has humour and sorrow with just the right amount of apprehension and thrill. I love the way I received an ARC in exchange for a review so here is mine. This is book 3 in the Psychic Surveys series.. It is not a standalone, and you will need to read the first 2 books to get the full depth of the story. I absolutely loved this book! The whole series so far has been amazing, but this one has just hooked me! I could hardly put it down! I love how in depth the histories go, as well as the details on the hauntings the team encounters. I've always had a fascination with stories that are tied to places, and I get that with this series. Amazing Series!! I absolutely loved this book! The whole series so far has been amazing, but this one has just hooked me! I could hardly put it down! I love how in depth the histories go, as well as the details on the hauntings the team encounters. I've always had a fascination with stories that are tied to places, and I get that with this series. This one wasn't as dark as book 2, but it was heartwarming and provided a nice twist! Another interesting and page turning tale of the people and spirits in the world of Psychic Surveys. The characterisation is good and the mystery keeps you guessing, and trying to work out the whats and whys right up to the end.There are periods where things drag as the pacing seems a bit inconsistent but not to the point of skipping pages or skim reading and it could just be me. Ruby is an interesting character, at times quite unlikeable, whiny and lacking in emotional intelligence and maturity, Another interesting and page turning tale of the people and spirits in the world of Psychic Surveys. The characterisation is good and the mystery keeps you guessing, and trying to work out the whats and whys right up to the end.There are periods where things drag as the pacing seems a bit inconsistent but not to the point of skipping pages or skim reading and it could just be me. Ruby is an interesting character, at times quite unlikeable, whiny and lacking in emotional intelligence and maturity, and yet she works and feels quite real. The others are all also developing as individuals, as the series develops and in this one we find out a bit more about Ness in particular. I am looking forward to the next one. Another belter of a story from Shani Struthers. I absolutely devoured it and enjoyed every minute of it. The whole relationship of the Psychic Surveys team is captivating. The build up, the intensity, the vulnerability and the strength are brilliantly written. It even brought tears to my eyes. I would highly recommend it. Another great read featuring the Psychic Surveys team, one which completely absorbed me all the way through. It feels as though I could find Ruby, Cash, Theo, Jed and co in my own town, helping stranded souls to find the light ... not just between this world and the next, but within themselves, too. This one is my favourite so far ... up next, Old Cross Cottage! Yet again another amazing book by Shani Struthers. The in depth look into the characters helps brings her books to life. As I have said on previous reviews she has the ability to set a scene and create an atmosphere which really makes you get lost into the book. Truly great really do highly recommend this series! Can't wait for the rest! Wow. Very suspenseful right to the end. 5 stars really fits this book. I couldnt put the book down. Ready to move on to the next. I love this author. I gave it only four stars due to the fact i felt it was a little drawn out. This won't ,however, stop me reading the next book or any others in the future. This was Shani Struthers back to her best. A real page turner of a book, a gripping story with an unexpected end. Well recommended. And Shani hits another one out of the park again! Shanis books are always a joy to read and a horror to have to put down! Off to read the next book! I've also noticed that what is said to the spirits they wish to 'help' is getting longer, almost a lecture! Sorry about the negativity in this review, but Ruby and Chase are becoming a bit 'unreal'. I'm reading 'Old Cross Cottage' now which seems to be just Ruby and Chase, so far. I just hope Chase shows some savvy and plays hell with Ruby if she continues to keep going off on one, without giving her the usual speedy forgiveness! Brilliant. This is the third book in the series and I've really enjoyed all of them. Can't wait for the fourth one. This series is a good set of ghostly stories. Enough 'scary' to keep the suspense but you can still sleep at night. Though truly deserving of five stars there were many typos, and not because of some the differences in spellings between Britain's English and America's English. Another 5 star read from Shani, have loved all her books so far, if you like anything about ghosts of the supernatural you will love this and all her books,can't wait to read the next in this series to see what Ruby and co are up to. Inizia come un acchiappafantasmi: una giovane donna, proprietaria di un'apposita agenzia, si dedica alla disinfestazione delle molte case infestate di Londra e dintorni, poi, un giorno, succedono due cose. La prima: una di queste infestazioni si rivela particolarmente virulenta, con uno spirito che non ne vuole sapere di levare le tende e passare oltre. La seconda: una giovane donna contatta l'agenzia perché ritiene di essere un caso di reincarnazione, e riesce a far sì che ci si occupi del suo Inizia come un acchiappafantasmi: una giovane donna, proprietaria di un'apposita agenzia, si dedica alla disinfestazione delle molte case infestate di Londra e dintorni, poi, un giorno, succedono due cose. La prima: una di queste infestazioni si rivela particolarmente virulenta, con uno spirito che non ne vuole sapere di levare le tende e passare oltre. La seconda: una giovane donna contatta l'agenzia perché ritiene di essere un caso di reincarnazione, e riesce a far sì che ci si occupi del suo caso nonostante la materia non sia di normale pertinenze dell'agenzia. I due casi finiscono per intrecciarsi, portando alla luce un caso particolarmente brutale di violenza domestica. Insolito nel suo genere, e piuttosto ben scritto, riesce gradevole nonostante un paio di punti siano poco chiari, scotto da pagare al suo essere un secondo volume e al non aver letto il primo. Ringrazio Crooked Cat Publishing e Netgalley per avermi fornito una copia gratuita in cambio di una recensione onesta. It start as a Ghostbusters: a young woman, owns of a special agency, dedicated to the disinfection of the many haunted houses in and around London, then, one day, two things happen. The first: one of these infestations is particularly virulent, with a spirit that is not to break camp and move on. The second: a young woman contacts the agency because she believed to be a case of reincarnation, and is able to ensure that they take care of her case despite it is not being material to normal agency appliances. The two cases end up intertwined, revealing a particularly brutal case of domestic violence. Unusual in its genre, and rather well written, manages to be pleasant despite a couple of points are unclear, price to pay to his being a second volume and to not having read the first. Thank Crooked Cat Publishing and Netgalley for giving me a free copy in exchange for an honest review. I've read the psychic surveys book back to back, unable to put them down and this one didn't disappoint at all. The only downside is I know the next one is the last, well until spring anyhow! I bought the Psychic Surveys books for my mum as she enjoys gentler stories and these fit the bill perfectly. I guessed fairly early on that 44 Gilmore Street and Ellie were connected but initially couldn't figure out how. Whilst not as creepy as the previous two books it was still a good read so if you're looking for a contempory ghost story this one fits the bill.